Raising awareness: Public ivory crushing – the sanctioned destruction of a product generally recognized as highly valuable – should get the attention of those who have somehow managed to ignore the ongoing destruction of some of the planet’s most iconic species. Poaching activity has ballooned over the past few years, with an estimated 96 elephants currently being killed – on a daily basis. 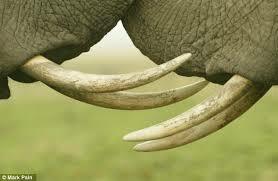 Highly prized African elephant (Loxodonta africana) tusks. Cutting off the income of traffickers and extremist groups: Wildlife trafficking funds large, organized criminal networks. Trafficking has an estimated annual value of $10 billion, and ivory traffickers are known to deal in narcotics and weapons, as well as fund extremist groups. Sending a message: Many countries may not be willing to make the case to major trading partners such as China that the ivory trade will no longer be tolerated – but the destruction of ivory on this scale is a clear signal of this intent. Over 40% of illegal ivory finds its way to China. While some argue for flooding the market with ivory in order to cheapen its desirability, in the current climate, this would likely only expand the market. Undermining corruption: Once destroyed, the ivory stocks cannot be filtered out for illicit sale and the laundering of newer, illegal ivory. The 1989 Convention on International Trade in Endangered Species outlawed ivory trade and poaching, with the exception of ivory that was collected prior to the convention. 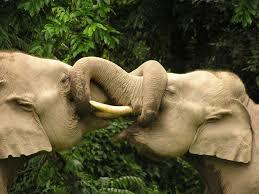 Less of a concern in the US than in other countries, old ivory has been filtered out in exchange for new ivory. Via executive order, President Obama formed the Advisory Council on Wildlife Trafficking this summer to support increased efforts to ban wildlife trafficking. These developments are all positive. Still, I’m not quite sure what to make of the fact that the US State Department has framed the trafficking crackdown as a ‘national security crisis’ as well as a conservation issue. Destroying ivory stocks sends a powerful message – the US and the Philippines are the only countries outside of Africa to have taken this step, and China continues to claim that illegal poaching is Africa’s problem. But I’ll be withholding heartfelt applause until I see what further steps will be taken to undercut this lucrative blood trade. Bryan Christy blog – National Geographic journalist, well-known for his work on the illegal ivory trade, comments on the strategy of the destruction of ivory stocks.